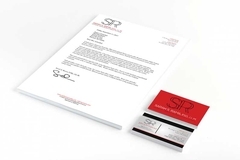 We just made Business Cards and a Letterhead template for Sarah S. Rama, ESQ., LL.M. Virtual Vision can make your business cards exactly how you want them and they will be shipped directly to you. We can also create letterhead, marketing materials, signage, and more. Contact Virtual Vision for a quote.